The Manhattan Cocktail Classic is back in its fifth year, uniting NYC’s boroughs in the name of great cocktails and culture from May 17-21. Last year’s Classic attracted more than 8,000 attendees, and this year’s nearly 100 events will once again bring delicious concoctions from around the world to the Big Apple. Events during the five-day celebration are independently organized and held at unique venues, so you won’t have to travel far to imbibe. Take your pick of parties, tastings and tours at notable bars, restaurants, art galleries, museums, barber shops, theaters and libraries across Manhattan, Brooklyn, Queens and Staten Island. This year’s 100+ events are selling out quickly, so check out these events and grab tickets before they’re gone. Tickets range from $25-$395; all event attendees must be 21 or older and prepared to present a valid photo ID. The Manhattan Cocktail Classic kicks off opening night with this black-tie optional soiree, spanning four floors and over ten million cubic feet of space in The New York Public Library’s main branch. Last year, guests sipped more than 30,000 cocktails, courtesy of 150 of the world’s top mixologists. Get ready for more unlimited cocktails this year, and come hungry to enjoy delectable finger foods from meatball sliders to oysters and jumbo shrimp. 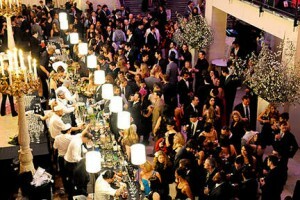 Mingle with 3,000 fellow cocktail enthusiasts to the tunes of live jazz bands and DJs providing the evening’s entertainment. Buy tickets asap — the Gala will likely sell out soon. Uber VIP Package ($395) offers entry to the Gala at 9pm, plus a free ride to and from the NYPL courtesy of Uber (up to $100 credit), plus a three-day pass to the Industry Invitational, to be held at the Andaz 5th Avenue Hotel. Relax for the afternoon as Joe Campanale, Executive Beverage Director at L’Apicio, and Adam Schuman, Spirits Portfolio Manager at Michael Skurnik Wines, introduce you to the world of aperitivi. You’ll learn the rich history of one of the original Italian vermouths, whose recipe dates back to the 1890s. As you learn about the evolving history of the Vermouth and its role in today’s cocktail culture, you’ll have the chance to taste the Vermouth on its own, followed by a few original cocktails paired with L’Apicio snacks. L’Apicio, 13 East First Street (between Bowery and 2nd Avenue). This entry was posted on Tuesday, May 7th, 2013 at 2:23 pm	and is filed under Stuff to Do. You can follow any responses to this entry through the RSS 2.0 feed. You can leave a response, or trackback from your own site.